This year our friends at Moog Music, Inc. had a very different sort of booth. Instead of the usual array of gear for demonstration, the space was bare and stark, with a simple kiosk and a wall dedicated to the many synthesizer players and innovators we lost in 2016. It was a rough year for the synthesizer community. Among those we lost were Pauline Oliveros and Don Buchla, both of whom were memorialized here on CatSynth and whom I had known in person. There were also images and statements for Keith Emerson, Bernie Worrell, Isao Tomita, and Jean-Jaques Perrey. Visitors were invited to wander the space in contemplation or with a mix of music from the artists on classic Walkmans. Visitors could also leave social media tributes to one or more artists and have an opportunity to win one of several current Moog instruments, including a Werkstatt, Mother-32 and even a new Model D.
We didn’t win, but were very touched by the way Moog used their space to pay tribute to the many heroes we lost in 2016. It was a unique and moving experience at this year’s NAMM show. 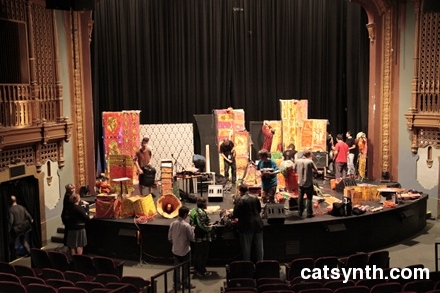 A few weeks ago I attended two performances at the San Francisco Electronic Music Festival. I did live tweets at the time, and now present a more detailed and reflective account. The performances took place at the Brava Theater in the Mission District. There was also a satellite event at the de Young Museum which unfortunately I was not able to attend. The piece began with a low rumble and drones. The sound grew denser, sometimes forming a minor harmony, and other times distinct beating patterns were audible between the long tones. Later on, the drones became higher in pitch and more “anxious” sounding and were mixed with other sounds, including something that sounded like metal objects being rubbed against one another, or bowed strings. The sound gradually became louder and more all encompassing, sometimes resolving back into a single harmony or pitch, and sometimes into a series of perfect intervals, along with some more more metallic and bowed sounds. Bracken was immediately followed by John Chowning, who came out to talk to the audience before his set began. Many readers are undoubtedly familiar with Chowning as a pioneer in sound synthesis,and his invention of modern FM synthesis. But Chowning is also an accomplished composer and his pieces are quite beautiful. Turenas made extensive use of both FM synthesis and his early work moving sound sources in 360-degree sound space. Indeed the piece seemed to be composed of tiny particles of sound that seemed both natural and synthetic at the same time, and which were moving very strongly around in space. The third piece was a more recent composition Voices v.2, and featured soprano Maureen Chowning on voice. 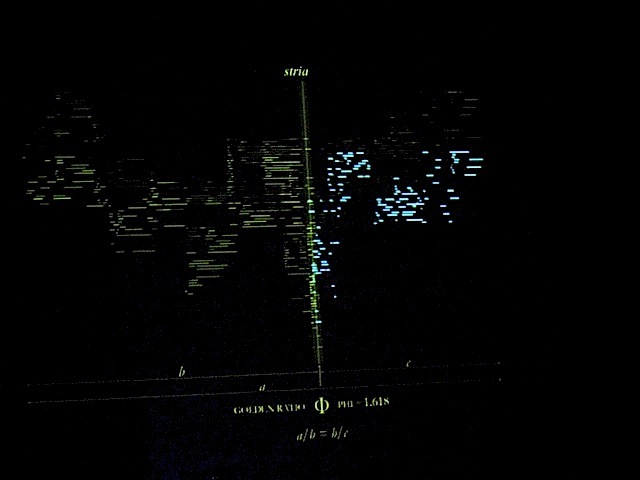 Pitches from her voice were tracked by a program written in Max/MSP and used to control FM synthesized sounds that are then remixer the voice and spatialized into the auditorium. 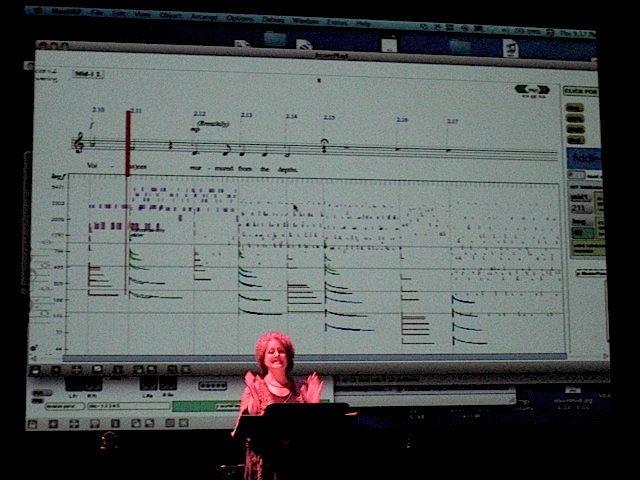 As Maureen Chowning was singing the piece, the Max/MSP program plus the score were projected onto the screen behind her, where the audience could see the efforts of John Chowning cajoling the program into behaving itself in real time. 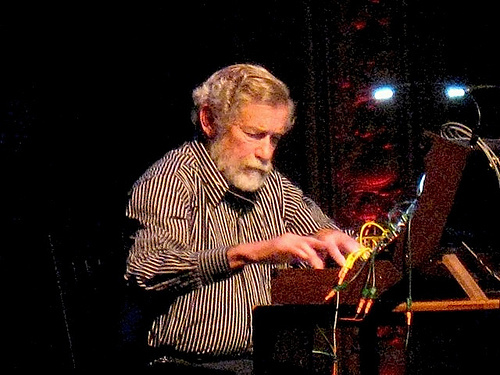 The final set featured another pioneer in synthesis, Don Buchla, who continues to mahis Buchla analog synthesizers to this day. 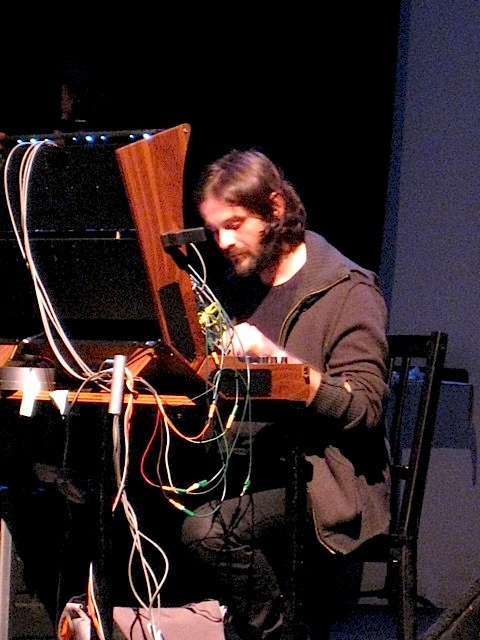 He was joined by Alessandro Cortini (aka “blindoldfreak”), who may be familiar to readers for his sonoio project. They began the set with a piece for “dueling Buchlas” by Cortini entitled Everything Ends Here. It opened with low notes and filtered analog drones, followed by sounds that were more windy and wispy before becoming more defined. There was a pattern with suspending major harmonies, then loud noises, moments of massive distortion, and then very low “sub bass” tones. The next piece, Buchla’s En Plein Vol began as a standard piece for percussionist (Joel Davel) with a marimba, cymbals, temple blocks, gongs and other conventional instruments. At some point during the performance, Cortini wandered onto the stage. He lingered nearby, and then very conspicuously walked off with one of the temple blocks. He and Nannick Bonnel continued to come by and remove instruments. However, as each item was pilfered, Davel continued to play the same sound in the empty space, as if it was still there. This trick was likely accomplished by using synthesized sounds controlled by a Buchla Lightning. The piece continued in comical fashion until all the instruments and eventually the performer himself were removed from the stage. 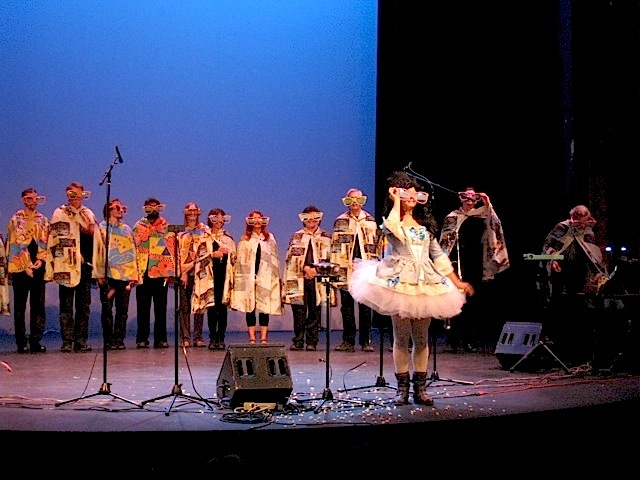 Buchla and Cortini returned to the stage in full Carnaval attire. Buchla set in motion a pattern with a frantic jumping rhythm and an out-of-tune sequence of soft analog waves. Gradually, the music became more percussive and rhythmic, and on the screen were scenes of Carnaval percussionists. A parade of masked performers began to descend into the theater from the back, often stopping to “play” with the audience (I’m pretty certain it was Gino Robair who had a little fun with me as I attempted to “live tweet” what was unfolding). The music became a combination of synthetic drumming sounds, whistles and noisemakers. After a few rounds that did truly resemble a mini Carnaval parade, the performers ascended to the stage and formed a large semi-circle for the final piece Parabolic Trajectories. The performers all donned large comical sunglasses – which did elicit a bit of laughter from the audience. Buchla then started up the main instrument for this piece, an old fashioned popcorn maker. As the performance drew to a close, randomized percussive sound (and mildly burnt odor) of the popcorn filled the theater. I also attended the Saturday performance, this time as a volunteer usher. In between my ushering duties (which mostly consisted of holding a really cool flashlight and occasionally asking someone not to bring their food or drink into the theater), I was able to see and hear the full show. 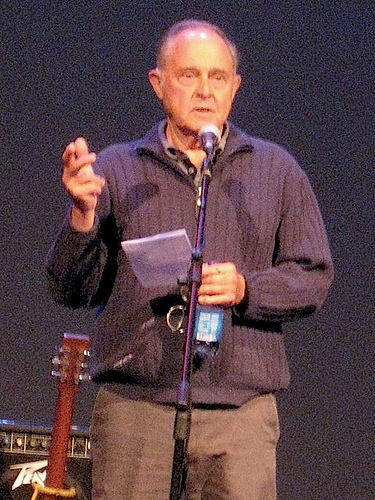 Joseph Hammer opened the program with Road Less Traveled, An improvisation-based composition featuring sound loops and other found sonic material. The intention was to build in a senepse motion and narrative with the changing sound palette, a “journey with uncertainty as thr goal.” Musically, the loops at the beginning were more folk-rock samples (which in a tweet I suggested required the medical gloves that Hammer was wearing.) Over time, the source material incorporated more funk and classic R&B, which worked better for me. Stephan Mathieu performed an extended version of Alvin Lucier’s Music with Magnetic Strings, in which the strings of an Ottavino Virginal, a small Renaissance clavier, were set into vibration by five electromagnets. The result was a sound image that was at once very Tarkington and simple, but also full of complex details such as beating patterns between sustained tones. There were also plucked strong sounds (at least as far I was able to discern) and also an ebow placed on top of the strings at one point in the piece. The very minimal structure and sound of this set may have been a challenge for some listeners. For me, I think I was in just the right mood to be receptive to something like this where I could completely defocus. The final performance of the evening and of the festival was by Caroliner Rainbow. The group describes itself as “an Industrial Bluegrass/Experimental/Noise conceptual art Costume Rock band.” I am still not entirely sure what “industral bluegrass” is, but the aural and visual experience is certainly unique. The first thing one notices is the large and elaborate stage set. The colors, shapes and textures seemed to be somewhere between psychedelic and urban graffiti, with bright fluorescent hues. For some of the performers, it was challenging to tell where the set ended and the costumes began, until one saw the performers’ motions, which ranged from standard performance gestures (e.g., guitars, drums) to odd back-and-forth rocking. The performers and stage did seem to function as a single entity. Musically, the performance was something between noise and experimental punk rock, with big flourishes of piano, organ, drums, guitar and electronic noises. These seemed to come in bursts rather than as a single long phrase. Some friends of mine had seen them perform years ago, with one of the more memorable moments between a squeaking fiddle – this was present in this performance in between some of the other sounds and gestures. 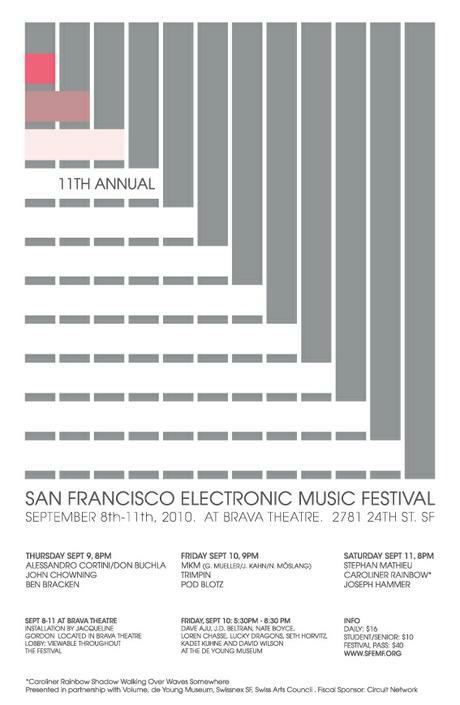 The 11th San Francisco Electronic Music Festival will be happening today through Saturday and I plan to be there for at least the performances tonight and Saturday. Once again, I will be live-tweeting and readers can follow on Twitter @catsynth or via the #SFEMF tag. So those not in the Bay Area can follow along vicariously – though I encourage local electronic-music enthusiasts to attend in person. The performance tonight includes a collaboration of Alessandro Cortini, whose videos and images we have been featuring here on over the past coulee of months, with Don Buchla. Also performing are another synthesis pioneer John Chowning, and Ben Bracken. You can see the full schedule for the event here.